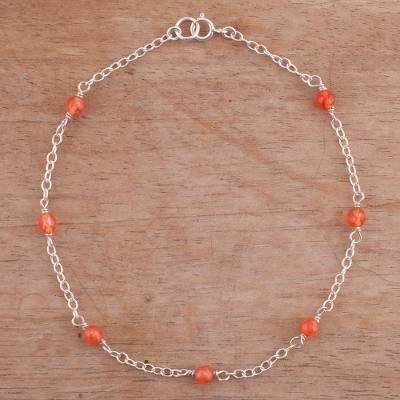 Orange Quartz and Sterling Silver Anklet from Peru, "Leisurely Walk"
This lightweight, breezy anklet by Marianela Vargas brings the orange beauty of dyed quartz gemstones. Sterling silver chain connects the stones for a sensational accessory. You can find quartz anklet 'Leisurely Walk' by Marianela Vargas in jewelry categories such as Birthstone Anklets, Quartz Anklets, Silver Anklets, Sterling Silver Anklets, Chain Anklets and Station Anklets. Enjoy exploring these sections for other Novica treasures.